The truth was in the rumor. Mississippi nights was closing, and last Friday night it was finally put down like a faithful dog that the family just couldn't find a use for anymore. I didn't go, there was no reason to, because the memory is far sweeter than any last ditch effort to create for ten dollars could. The sad fact is that it is one more nail in the coffin for the music scene in St. Louis. The Rocket Bar left us some time ago and will always live fondly in my head, though wearing your Tevas was apparently an inferior second when there is a guy dressed as Sgt. Pepper (don't ask if you don't know the story). The Galaxy went the way of the Dodo some time ago after the Rocket Bar. For me Galaxy will forever remain as my favorite experience with The Bottle Rockets. Growing frustrated with the club's poor quality sound equipment lead singer Brian Henneman finally gave up with a clear "F*** it!" threw down the mike stand unplugged his Pevy and with band mates in tow left the stage and stormed out the back into the alley. I wonder if they will ever remember the three guys who went with them. Then when no was looking someone did a drive by on us all when Frederick's Music Lounge quietly departed. This place was maybe the most unique of all in having the distinct appearance of looking like a bar in the basement of a house, or maybe it was because it was a bar in the basement of a house. The stage that had to be no bigger than a saltine cracker but for $5-$8 you could see Diesel Island, Hydacol, Oat Soda (whatever happened to them) squeeze in and play. "Buy my book!" Then my heart break happened last fall. The Hi-Pointe closed. Where PBR was expected, girls had tats and pig tails, a pair of corporate khakis were forbidden and there was always some old guy who probably never knew he was at Wood Stock sitting at the bar that everyone talked to and showed respect to just because it was proper to do so. The best bachelor party ever was thrown there, Brian Henneman's Christmas show reminded you that you had survived the year somewhat intact. Now Mississippi Nights has walked the green mile. Though I saw a few bands there two nights in particular stand out. When the Wife and I were still dating, I took her and her closest confederate down the river of frozen springs in July and after nights of sleeping in the back of the old Cherokee, floating at least 3 or 4 hundred miles in two days we shot back to town, hitched a ride on the Metro and saw Nickel Creek. There I learned it was indeed possible to sleep standing up in front of a live band. But the best concert experience I ever had was May 9th, 2003. 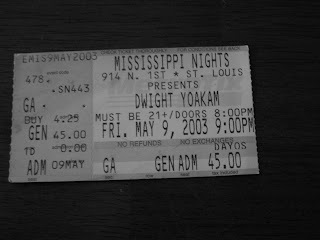 Dwight Yokam came to 914 N. 1st street and played.At the time I was broke, I mean the real kind of broke, but Bahr not wanting Meers and I or himself to miss the experience took tax refund money and showed up at the old 6041 Waterman Roost with three tickets. Life had changed for me a lot between 2002 and 2003 as God took me to some uncomfortable places and made me reevaluate my decision making paradigms, but He also gave me a gift through a friend's good grace that I'm not sure can be repaid. Dwight played the way you would want him to. Hat low and guitar held high, talking to the crowd in the Kentucky/Backersfield drawl swiggin a beer. Then when the band left the stage he stayed with just a guitar and a stool and played unplugged for a good forty-five minutes. Why the three of us never thought to make a boot leg will forever escape me. Friday nights are different lately, when we do get to head out to hear some little band its left to Cicero's or the Duck room, and we leave the Courtesy Diner at 1am instead of arriving. My heart breaks for some north county white guy in his early twenties who is beginning to see the music world outside of Best Buy and the Pageant for there are no good dives left. All the frontiers are closing and we ain't the better for it. By now you are more than use to seeing the signs that say "NO GUNS" or have the picture of a pistol with a circle and a slash through it. Though the picture only signs in my opinion could readily be misinterpreted. How you ask? For instance the predominate sign on doors in St. Louis County Government buildings have a large semi-automatic pistol in black posted. Everytime I walk into those doors I think "hmmm no full size Beretta 92 or 96 pistols, or Taurus pt-99/100s". If you go into your neighbor hood Dobbs Tire & Auto center they don't want you carrying a Colt Detective Special snub nose revolver. Does this mean that my Smith & Wesson 442 snub nose is okay? In Shrewsbury the local community center has a sign that reads "NO FIREARMS" though I can tell you in their heart of hearts they mean to say No Concealed Weapons. The difference, well according to Missouri Law if you hold a concealed weapon license you could very honestly carry a two bit axe with a sawed off handle under your coat inside and be legal. Why because the sign specifically prohibits firearms. When I see those signs there is a group of cheereleaders in my head going "beee specific...be be specific". But I digress, the most jack-assinine thing about these signs is that they do nothing. Aside from the court house no one backs these signs up with metal detectors. Why because it is bad for commerce and public relations. If you notice sometime Commerce Banks have "No Guns" signs hanging up on their doors. This is to make the local anti-gun crowd feel good. If you walk into a US Bank you won't see one, nor will you in Blockbuster Video as opposed to some local owned video shops. Why? Nation wide companies have dealt with the CCW thing for the last ten + years and they have come to the conclustion that, 1- they alienate some consumers who protest their business and are law abiding gun toters. B-(yes I know I said 1) the guns are umm concealed and you don't know whose got them, so its rather pointless. Never mind the fact there has yet to be a case in the United States of America where a person who had a carry concealed license walked out of the Sherriffs office with the newly printed card, got in the car and drove to the bank and held it up. Its that whole good guy/bad guy thing. Oh yeah so what exactly happens should you be sitting in that nice italian restaurant with the NO GUNS! sign at the door and you are packing your 200 round high capacity semi-auto revolver mega blaster and it slips down your pant leg and clatters onto the floor for the entire world to see. According to MO law they can do nothing more than ask you to leave. Refusing leads to law enforcement to issue you a ticket. You still refuse well then you get a nice pair of matching nickel bracelets (and you should). If only someone would have thought to put a NO PLANE IN BUILDING signs on the door of the World Trade Center. Maybe if there had been federal law requirements that the back of a boarding pass read "by entering this aircraft I agree not to hijack this plane" 9/11 never would have happened. It's a bad world out there kids and if you look like food you will be eaten.